Our June issue also features articles on Phylogenetic Methods, Physiological Ecology, Biomonitoring and Conservation, Species Distribution Monitoring and Bioinformatics. This month’s cover image is a photograph taken during a survey of seafloor habitats and associated groundfish species, conducted by NOAA Fisheries from an occupied submersible on a Southern California bank at a depth of 80 m (262 ft). The species shown are Rosy rockfish (Sebastes rosaceus), Starry rockfish (Sebastes constellatus), California Scorpionfish (Scorpaena guttata), Blackeye goby (Rhinogobiops nicholsii) under the jaw of the Rosy rockfish, and an unknown Sculpin (Cottidae) under the pelvic fins of the Rosy rockfish. Multispecies surveys frequently record presence/absence or counts for multiple species at each survey location, and the distribution of abundant species is likely to be informative about the distribution of rare species whenever these species’ distributions are correlated due to similar habitat preferences. Distribution models for multiple species (“joint species distribution models”) can now be analyzed using spatial factor analysis (as shown in ‘Spatial factor analysis: a new tool for estimating joint species distributions and correlations in species range‘) to simultaneously estimate a low-rank approximation to the distribution of all species in a community. Spatial factor analysis builds upon recent advances in estimation for Gaussian random fields, and is shown to improve estimates of next year’s catches using a single year of count data for rockfishes in the California Current (such as those shown here). Photo © Mary Nishimoto (UCSB/NOAA Fisheries). 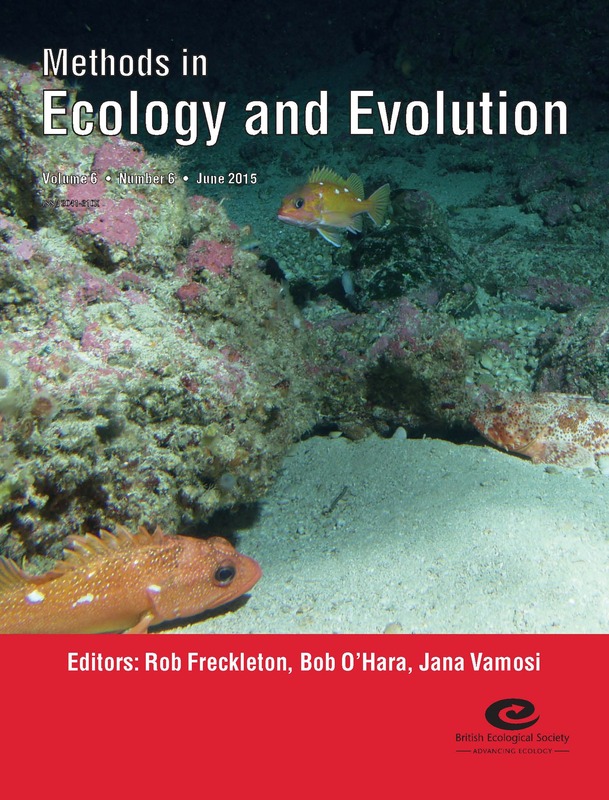 This entry was posted in Journal updates, Methods papers and tagged Behavioural Ecology, Bioinformatics, Biomonitoring, community ecology, conservation, ecology, Encounternet, evolution, methods, open access, physiological ecology, Proximity Loggers, Rosy Rockfish, Spatial Factor Analysis, Species Distribution Monitoring, VirtualCom by Chris Grieves. Bookmark the permalink.